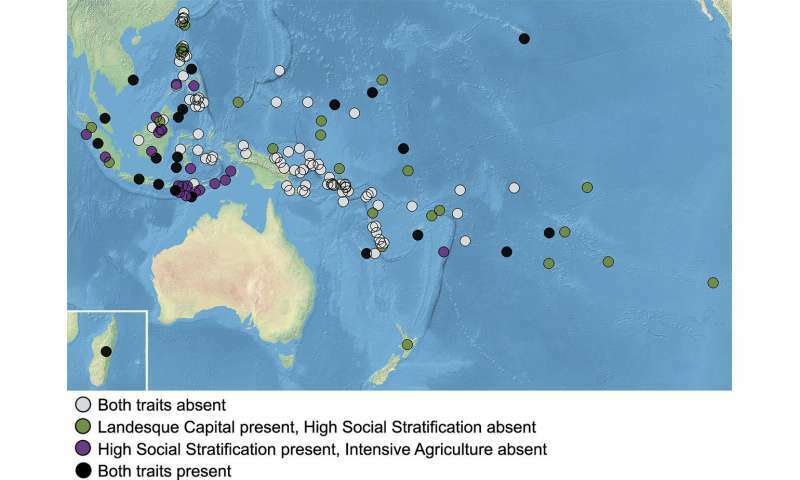 Distribution of intensive agriculture ('landesque capital') and high social stratification in the societies analyzed. Each filled circle represents one of the 155 societies in the sample, and its color corresponds to which traits are present in that society. Credit: Sheehan et al. Coevolution of intensive agriculture and sociopolitical hierarchy. PNAS (2018). A long-standing debate in the field of cultural evolution has revolved around the question of how and why human societies become more hierarchical. Some theorize that material changes to a society's resources or subsistence strategies lead it to become more hierarchical; others believe that hierarchy is the cause rather than the result of these changes. Many see the answer as being somewhere on the spectrum between these two extremes. In order to test these theories, a group of researchers from the Max Planck Institute for the Science of Human History and the University of Auckland examined 155 Austronesian societies, the results of which are published in PNAS. The societies examined had a geographical range stretching from Taiwan to New Zealand, Madagascar to Easter Island. They are also diverse in terms of social stratification and agricultural practices, making them a good fit for the study. "The Pacific is an ideal setting to test these ideas," explains senior author Quentin Atkinson, of the Max Planck Institute for the Science of Human History and the University of Auckland. "It's like a giant natural experiment with populations spread across hundreds of islands with different political institutions and modes of subsistence. And we know the cultural ancestry of these populations because it is encoded in the languages they speak." These societies varied from egalitarian to rigidly stratified, and their agricultural systems ranged from among the least intensive to the most intensive in the pre-modern world - the rice terraces built by the Ifugao people of the Philippines have often been described as the "eighth wonder of the world." The results of the study showed that there was not a simple causal connection between changes in a society's mode of agriculture and increasing hierarchy. Although in many cases agricultural intensification appeared to coevolve with sociopolitical hierarchy, in other cases, these traits appeared independently of each other. When both traits did appear, it was not always the case that intensive agriculture came first. "There's a widely held view that material changes to the environment drive social evolution and not the reverse," states Atkinson. "Our findings challenge that view and show that the causal arrow actually goes both ways." "The findings suggest that intensification and hierarchy promoted each other, perhaps as a part of a feedback loop that may also have involved population growth," explains first author Oliver Sheehan, also of the Max Planck Institute for the Science of Human History and the University of Auckland. "These results reveal how social and political factors, far from being secondary to the process of cultural evolution, are among its most important drivers." Study co-author and current Managing Director of the Max Planck Institute for the Science of Human History Professor Russell Gray states, "This study shows the power of computational phylogenetic methods to test causal hypotheses about human history." The researchers next hope to conduct similar research in other areas and in other cultural contexts.